Defence Minister Mohamed Nazim has said there is no proposal to establish a US base in the Maldives, and that a ‘Status of Forces Agreement’ (SOFA) currently under discussion only concerns joint military training exercises between the two nations. “It is an agreement signed to carry out military training exercises with other countries. There is no proposal to establish a US military base in the Maldives. The government won’t give that opportunity to any country,” Nazim told local media. The US Embassy in Colombo has also refuted reports of a planned US military presence in the Maldives. “There are no plans for a permanent US military presence in Maldives. SOFAs are normal practice wherever the Unites States cooperates closely with a country’s national security forces. SOFAs generally establish the framework under which US personnel operate in a country when supporting security-related activities and the United States is currently party to more than 100 agreements that may be considered a SOFA,” an Embassy spokesperson told Minivan News on Wednesday. 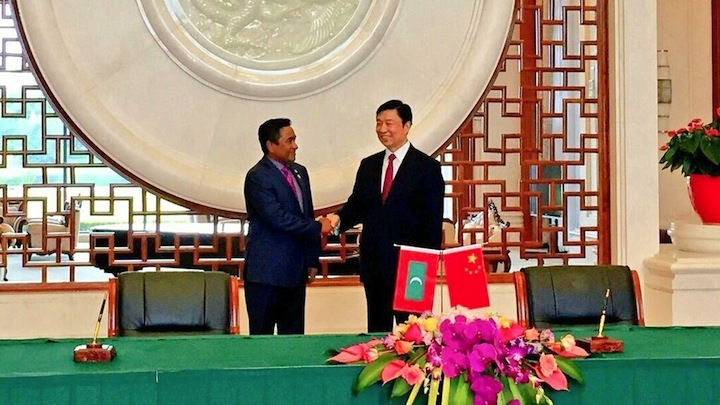 An apparent draft of the SOFA agreement was published by Maldivian current affairs blog DhivehiSitee on Wednesday. The draft outlines conditions under which US personnel and civilian staff would operate in the Maldives, granting them freedom of movement and the diplomatic immunities of the Vienna Convention, authority to carry arms, use naval and aerial base facilities, and the radio spectrum. US personnel in the Maldives would be subject to US laws and exempt from paying taxes and any undergoing any form of customs inspections.